This article is about the logistics and strategy for survival living in the wilderness. In other words what would a group of people need to survive off grid and living off the land. In a survival living situation you should expect to need at least around 2500-3000 kcal per person per day. Keep in mind that you might need more energy during the winter months (depending on your climate), because you metabolism uses more energy to keep your body warm. Depending on your latitude your food will mainly come from plants or animals. Generally, plant gathering is most important below 40 degrees north latitude, fishing more so between 40 degrees and 60 degrees north, and hunting most important above 60 degrees north . To study the logistics, let’s pretend that you are surviving somewhere where there are equally abundant plant and animal foods. How much wild foods would you need each year? This is something that survival tv shows really misrepresent. A fish and a couple of berries a day are not a sustainable diet. It will hold off starvation for a bit, but it’s not enough to even fulfill your daily needs. 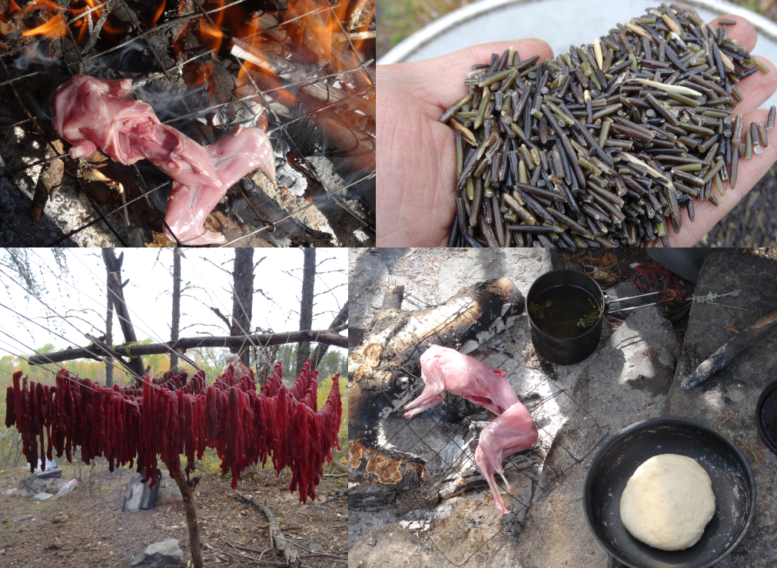 In the boreal forest the food staples are wild rice, moose, fish, beaver, bear, and hare/rabbits. Wild rice has 357 kcal per 3.5 oz (100 g) (wild foods nutrition info). If I wanted to cover half of my diet (1500 cal) with wild rice, I would need 337 lbs (153 kg) of wild rice to last a whole year. When I spent 6 months in the wild with my partner, we gathered about 80lbs of wild rice in a few hours (processing it manually took us way longer). We would have to gather rice for a week, working hard to harvest around 670 lbs to cover half of our diets for a year. Difficult, but possible. Now the other half would come from animal sources: fish, bear, moose, beaver, rabbits. If we managed to hunt a moose per year it would give us 300-400 lbs of boneless meat. 350 lbs of moose meat amount to 161,160 kcal. Divided into 1500 cal portions equals 107. A moose would cover half of our diets for 53 days (for both of us). Edible weight 95 kg (210 lb) equals 152,950 kcal. A bear would cover half of our diets for 51 days (for both of us). Assuming each beaver we catch gives us 13.6 kg (30.00 lb). It would amount to 379,600 cal. 20 beavers would cover half of our diets for 126 days (for both of us). Edible weight 0.86 kg (1.9 lb) would equal 98,040 cal. So 100 rabbits/hares would cover half of our diets for 32 days (for both of us). Would cover half of our diets for 108 days (0.7 kg edible weight = 325,500 cal). With a proper strategy, equipment (rifles, steel traps, and nets) and an experienced group. Gathering these foods seems a bit more attainable. Survival living seems less impossible with a food plan. To live off the land the least amount of energy should be expended, and more than enough food must be gathered; efficiency is key. 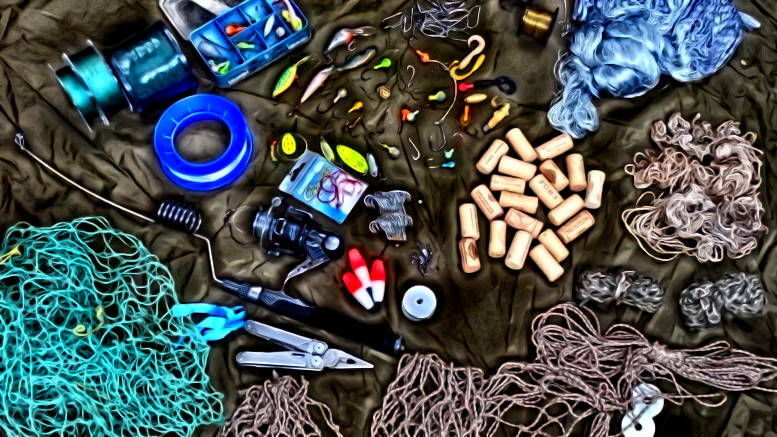 Hunters gatherers often camp on rivers, waterholes, or lakes, because resources are concentrated there, and partly because they offer easy travel possibilities. The base camp should be close to, fishing spots, traplines, hunting and gathering grounds, as well as firewood to minimize travel. Keep in mind that trapping and hunting is often more productive farther away from camp. Also being able to move camp is a good way of coping with unpredictable wild foods. The further north, the more extreme the seasonal changes. Which means that timing becomes even more crucial. Wild foods should be gathered at optimal times when less effort is needed to gather them and when they provide more benefits. For example trapping beaver before winter, when they are heavier and have more fat. Some animals are very nomadic and live in low densities to adapt to changing availability of food. Another strategy is that of hibernating or resting. Hunter gatherers shouldn’t work evenly throughout the year, unless they live in the tropics. In northern areas it helps to have a cyclical approach to work to adapt to seasonal windows of opportunity for foraging. Keeping your body and shelter warm requires energy, which directly or indirectly translates into more food. By having a shelter that is well insulated and incorporates fuel efficient heating you can reduce your need for gathering and processing firewood. Earthships can provide many ideas for improving the insulation of a shelter. And rocket mass heaters are more efficient than wood stoves in permanent shelters. Well insulated clothes are also very important for preserving calories. For groups without permanent shelters clothes are even more important. Time and energy are two resources that can be saved through efficient cooking. Solar cookers, non-electric slow cookers, and pressure cookers greatly reduce your firewood consumption, as well as save time spent cooking. During these times it helps to make a shift towards more reliable foods like fish and small game. It is a good idea to adopt technology that reduces the time needed for foraging. Nevertheless groups should still retain diverse technologies that are less efficient but more reliable or sustainable in the long term. For example using bows as a backup for rifles. Take advantage of travel corridors: packrafts, canoes, bicycles, skis, and sleds should be used to make travel more efficient and expand the range of your group. They make it easier to move firewood, construction materials, and big game. Often there will be short-term availability of food, so preservation and storage are important. Dehydrating, and freezing are practical ways of preserving food in the field. Canning is another option for homesteads. Food can be stored underground during summer months to keep it cool. As a complement to wild foods and depending on your climate and soil fertility around you, having a garden with tubers, and squash might be worth it. Chickens, goats, or rabbits could also be a great way of storing and producing food in a small area. 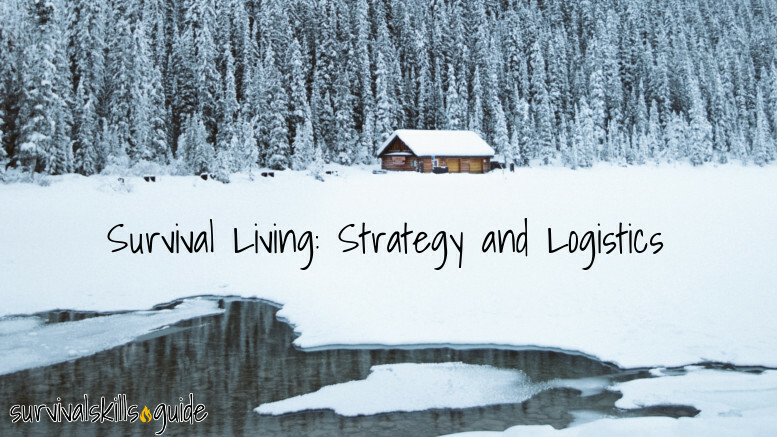 Be the first to comment on "Survival Living: Strategy and Logistics to Live Off the Land"